Kelso, Becca, Mimi, Ben, Mikey, Nikki and I rang in the New Year together in a small cabin blanketed by feet of fresh snow. 2017 marked Nikki and my 5th New Years together, funny enough, 4 of which have been spent with Ben Ipsen. It was quite the crew of cabin gamers, backcountry enthusiast and friends who trusted me enough to lead them deep into Central Oregon, further south than I’ve previous been. Mt.Bailey was the destination. 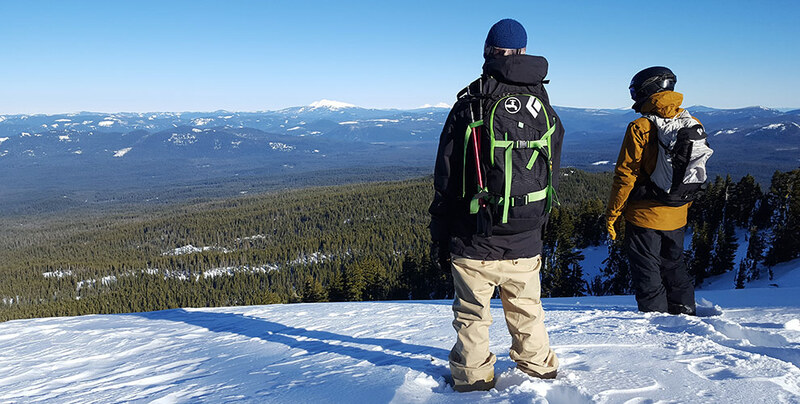 In search of sled accessed snowboarding, Bailey is a prominent locale on an Oregon short list. The crew bundled up for cold weather and incoming snow, then headed south for three nights of what turned out to be a very unique experience leaving us all smiling. In a mid trip low-point, I somehow lost my nice Canon camera while taking lake sunset photos and playing with Bruce in the snow. So this post’s photos comes to you curtesy of Mikey and Nikki. Having missed out in the past, we booked a 6 person cabin really early this time around. Not knowing anything about the resort, we were a bit surprise when we arrived to see so many snowmobiles. I love me a rustic cabin but these were a bit dumpy for the price. The entire resort vide was a bit dumpy and very redneck. 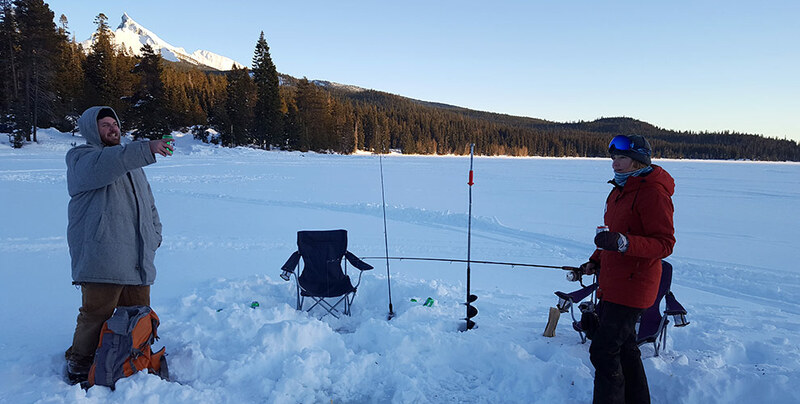 The buzzing of sleds never ends at Diamond Lake. Big diesel trucks and enclosed trailers filled every available plowed space for the big holiday weekend. Inside our cabin a nice wood stove with a healthy wood supply and ample interior space made up for the low-end decor. 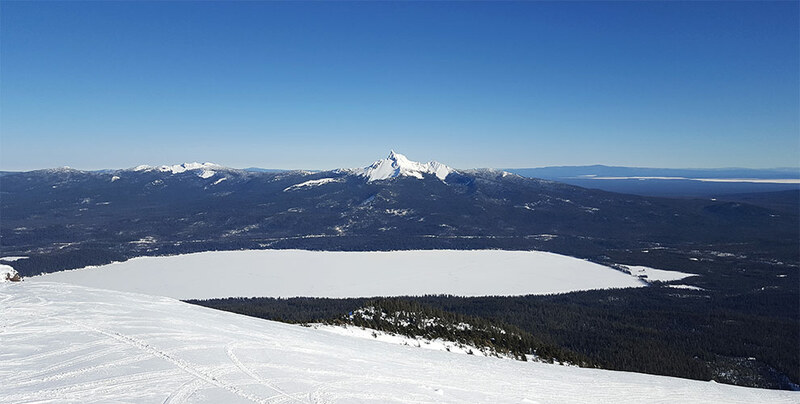 The setting of the resort is the real reason you go to Diamond Lake and it’s a beautiful, tucked between two volcanos. The sled trails leaving the resort to access Crater Lake and Mt. Bailey were in amazing condition for our visit. Whenever we travel to a trailhead with smooth trails, it spoils us rotten in comparison to our Adams trek. We got a short ride in with Becca and Mimi but never got them to the summit. They ended up entertaining themselves, exploring the nonexistent nordic trails and snowshoeing a very healthy distance to find a sledder pizza joint on the other side of the lake. The Summit of Bailey was a much further ride away from the lodge than expected. The distance delivered us sore backs and zapped any interest in returning with Becca and Mimi. Once we made the long 15mile wrap around the volcano, we were greeted by the groomed uphill trail to the summit. This trail was the reason we traveled so far south, to inspect the 2000 vertical foot elevator of a sled trail. The summit trail was indeed a very efficient climb that lead to alpine bowl snowboarding. Unfortunately we quickly learned that it didn’t offer an easy sled lap as we had hoped. 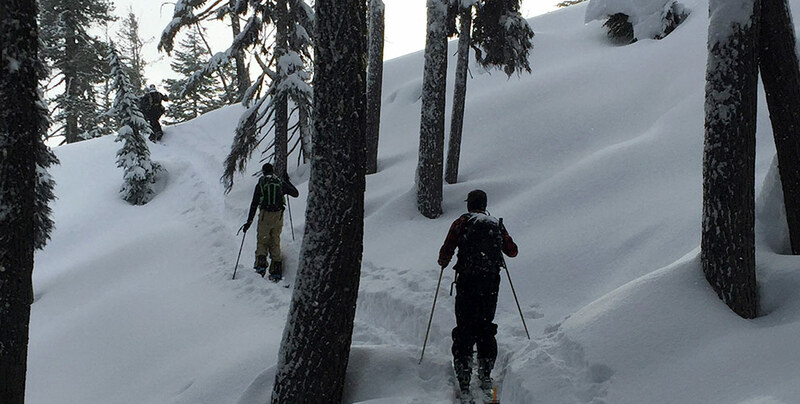 We decide to snowboard the northwest facing Cat Ski terrain. 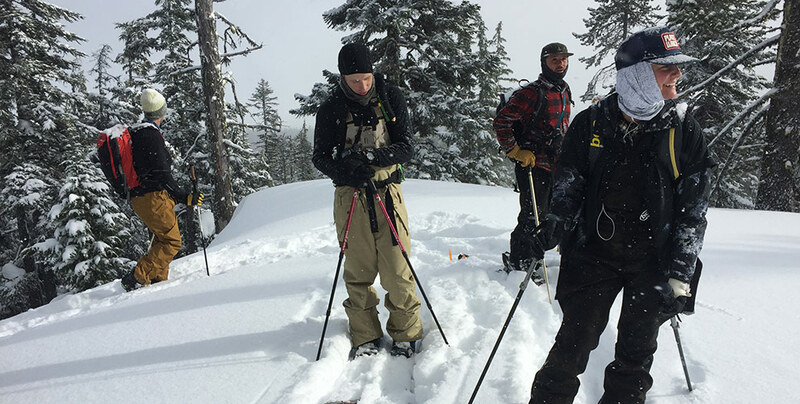 Inspection of the steep chutes showed a deep, stable snowpack that was very wind effected, making for reduced fun turns. It wasn’t until the bottom of the chutes that we learned why the sled lap didn’t work. We endured a 1 hour struggle to exit the line and wrap out of the wilderness back to the sled trail. The cat had not yet groomed their runout trail they take clients down. That did mean we weren’t getting yelled at for riding their terrain, which was nice, but also made for a mess of an exit out of the woods. We arrived back at the sled sweaty and defeated. 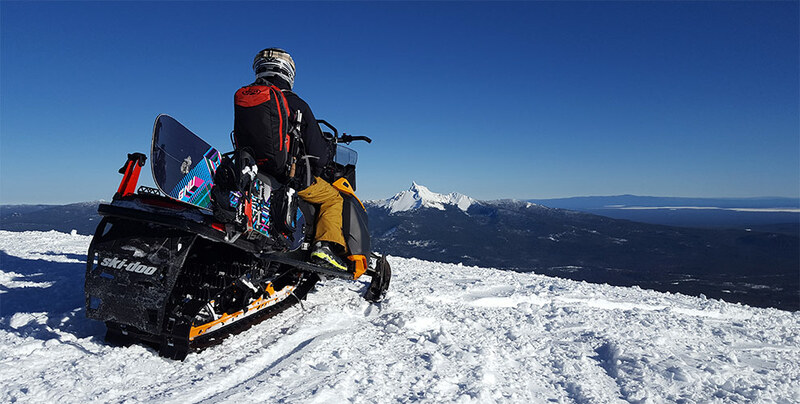 Later that night reviewing our line choice, we decided that there was a better possible sled lap but that Bailey is probably best used as a sled accessed touring zone. If I did Bailey again I would drive sleds to the summit and make splitboard laps touring the upper bowls. We sat around the cabin playing game and reviewing topo maps on New Years eve. A new plan was derived to drive sleds a short distance to a point where the flank of the volcano extends close down to the lake and then start walking from there. We toured for an hour and a half up a slight incline that would provide an easy exit. With the plan in motion we then hit a steep ridge-line that provided easy access to great looking snowboarding. Low density snow had fallen overnight and dumped during the tour. 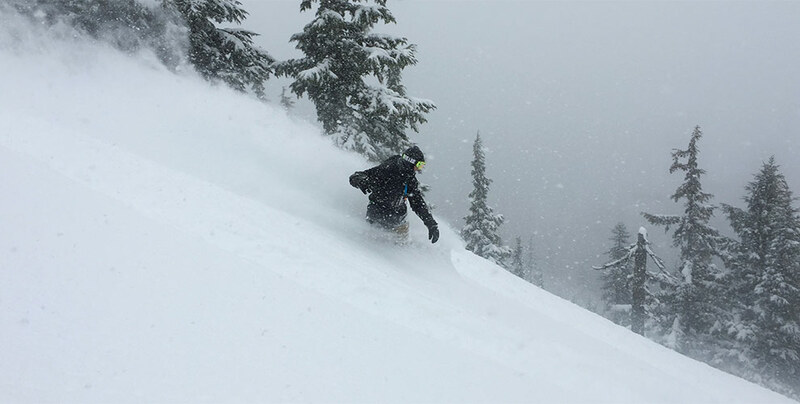 We found ourselves exploring a new zone that was covered in over a foot of fresh, blower snow. The crew was fired up on the lines we had discovered. Our late start and the pounding snow was fighting our progress but we pushed hard to make turns happen. We stayed low in the trees where small pillows and airs were abundant. With our group of 5, we packed down a highway of a skin track up the ridge, making for 3 quick and efficient laps before sunset. A new zone was discovered. It’s not close by to Portland but the options are worthy of our return.